To enlarge a small sized photo. To crop a small portion of a photo and enlarge it. When you use a normal image editor to enlarge photos or to upscale photos, they will do that, but mess up the photo pretty bad. This is where photo enlargement software come into picture. These free photo enlarger software will not only increase size of image, but also enhance them in order to get sharper, clearer, and noise free result. For this, these software follow various procedures and techniques, such as: sharpening, noise reduction, dithering, artifact adjustment, pixel repeat, interpolation, and resampling. You will also find bulk photo enlarger software that will help you enlarge multiple photos at a time. In the following list, I have included dedicated image enlarger software, as well as some famous image processors that let you enlarge photos on PC. You will get to know which method these software apply to enlarge and enhance photos. Also know how to increase size of photos without quality loss using these freeware. Here is the comparison of images enlarged and processed using the software that I have used to increase photo size. As you can see, after using photo upscaling software, the quality of image increased and the amount of grain reduced drastically. In my opinion, the best enlargement and processing is provided by Reshade Image Enlarger. You can also checkout the list of best free Image Resizer Software, Bulk Image Resizer Software, and Software To Add Text To Pictures. Reshade Image Enlarger is a free photo enlarger software that lets you batch enlarge photos. You can also process a single photo at a time. It provides various simple and advanced options to enhance photos while enlarging them. For photo enlargement, you can set custom width and height, set resolution, enable cropping, denoise, reduce artifacts, control texture, and set accuracy. The advanced options let you control JPEG compression, processing fidelity, and smooth gradients of the output photo. A 2 pane preview panel displays the original picture and zoomed in picture, so that you can vary the output parameters according to your choice. To enlarge a single photo, simply add a photo, set the adjustments according to your choice, and save the image. To enlarge multiple photos, simply go to the Batch Processing tab. Add the photos that you want to enlarge. Remember, the settings that you have applied for single photo enlargement will apply to all the photos added for batch processing. You can set batch output file parameters, such as destination folder, file naming, etc. This is one of the best free photo enlarger software with an added advantage of batch processing. SmillaEnlarger is an open source and free photo enlargement software for Windows. It not only lets you increase size of photo, but you can also crop and enlarge a portion of a photo. The software is really intuitive and lets you set custom photo enlargement parameters. 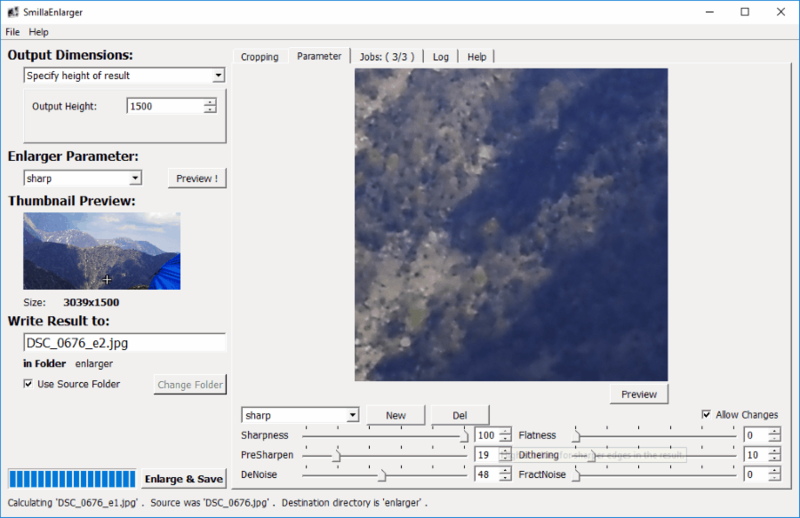 You can crop an area on photo to enlarge, set output image dimensions to define enlargement values, set enlargement parameters to set sharpness and noise, and more. All of this will help you obtain an enlarged photo of your choice. First of all comes the cropping part. You can either select the whole image for enlargement, or crop out a part of it. You can set cropping as free, set custom cropping ratio, square crop, or select from a list of cropping ratios available. For image enlargement, you will have to set output dimensions of your choice. You can specify a zoom factor, specify height, specify width, stretch to fit, or crop to fit a defined size. An enlarged image may loose its quality, thus you need to set Enlargement parameters for better enlargement results. Select from the following enhancement profiles: Sharp, Default, Painted, or Sharp and Noisy. You also get options to set Advanced enhancement parameters for the above profiles. It can be done by varying Sharpness, PreSharpness, DeNoise, Flatness, Dithering, and FractNoise. Once all of the above parameters are set, you can go ahead and enlarge your photo with this free photo enlargement software. Its a very easy to use software to enlarge photos, which can be used to enlarge only one photo at a time. The limitation to process a single photo at a time is justified as it lets you custom crop and enhance photos according to your choice. Also, the preview panel helps a lot while processing a photo. ImageEnlarger is another good free photo enlarger software for Windows and Mac. It lets you enlarge a single photo at a time. It has a very good feature that lets you enhance photos according to the image size you have set for enlargement. According to the defined canvas size, it displays a zoomed in portion of the original image. You can make adjustments to enhance image quality and view the changes in real time. This helps you render a sharp and noise free enlarged photo. After entering the image size for enlargement, you can adjust Sharpness, Flatness, Noise Reduction, and Dithering using sliders to enhance photo. After selecting an output folder, click on Calculate option to render the enlarged photo. A Sharper Scaling is a bit less advanced but easy to use image enlarger software. As the name says, it scales up a given image or a portion of an image and sharpens it without adding noise. Yes, it lets you crop a small portion of an image and enlarge it. You can also use this free photo upscaling software to batch enlarge photos. The workflow of this free photo enlarger software is pretty simple. Once you add a photo, you can select an area on the image to crop by adjusting the sides of the pink box. In the Sizing mode panel, you can select the type of selection and scaling required. Target size and scaling can be adjusted manually as well. The next step lets you select the type of enhancement for picture enlargement. You can choose from the following modes: Pixel Repeat, Bilinear Interpolation, Bicubic Interpolation, and Bicubic Interpolation and Sharpen. For each mode you select, you can preview and compare result on a dual pane preview panel. Once happy with the result, save the image on your computer in a desired folder. The bulk image enlargement module lets you select multiple images to process. The limitation with bulk processor is that you cannot crop images. You can set size for output images based on scaling, or desired width or height. Select output folder and begin processing. Its a pretty simple photo enlargement software without any complexity, making it friendly for newbies. Kneson Imagener is another free software to increase size of image. Its enhanced (basic) version is available for free and lets you enlarge photos on PC easily. It comes with an image preview panel and lets you enlarge photos based on percentage, pixels, inches, centimeters, etc. You can also set image resolution, choose resample method, and adjust resharp parameters. All of this helps you get clear and sharp enlarged photos. Do note that you can enlarge only one image at a time, and image cropping option is not available as well. This means, for cropping, you will have to use another image processor software. When you load an image from the File menu, it is displayed on the interface. Set the image enlargement size according to your requirement, set resolution, and choose a resampling method. The following resampling methods are available: Normal, Bilinear, Bicubic, Kenson, and Kenson Progressive. For image enhancement, you can adjust Resharp amount, radius, and threshold. Once you have made all the adjustments, simply Resize the image. After resizing, you can save the enlarged image on your computer. Do note that to download this software, you will have to enroll a working email ID on its website for newsletter, then only you will get a download link on your email. The email may land in the Spam folder, so do not forget to check that once you have requested for a download link. 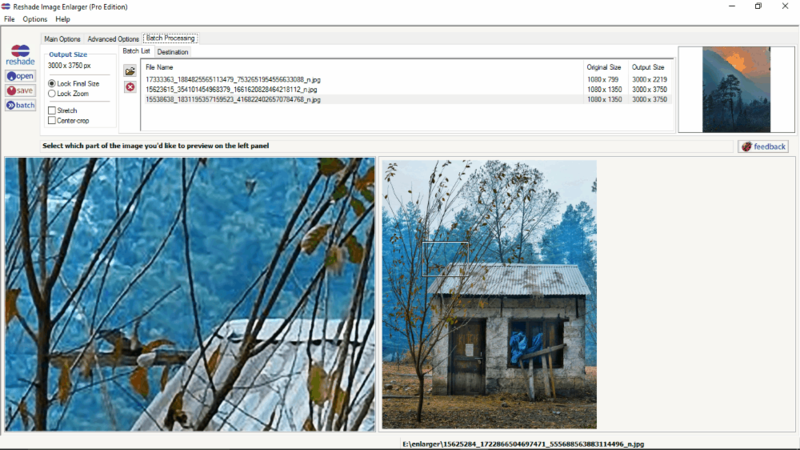 IrfanView is a free image viewer software that can be used to enlarge photos and carry out various other image processing tasks. The image up-scaling or the enlargement result may not be as good as the above mentioned software, but is pretty satisfactory. You can use IrafanView as a photo enlarger software if you do not have to upscale pictures multiple folds. For example an enlargement of 200×200 pixels photo to 400×400 or 600×600 pixels would give satisfactory result. IrfanView uses various image resampling methods to render an upscaled image of better quality. You can use any of the following sampling methods while resizing: hermite, triangle, bell, mitchell, b-spline, or lanczos. A lot of people have reported better results with Lanczos resampler. To enlarge photo, load an image; crop it if required. Now from the Image menu, select the Resize/Resample option. In the new window that opens, set the new image size, set DPI, select the resampling method, and apply the effect. Save the photo. GIMP is a well known open source image editor and image processor, which can be used as an image enlarger software. Just like IrfanView, it is not an advanced photo enlarger; however, you can use it to render enlarged images with satisfactory image clarity. The Scaling tool of GIMP, uses Sinc (Lanczos3) interpolation to preserve image quality while upscaling it. Begin with loading an image, then apply cropping if required. In the Image menu, select the Crop tool. On the small window that appears, enter the image size and resolution. Select the Interpolation method as Sinc (Lanczos3), and apply the Scaling. As you zoom in, you will be able to view the applied effect. I expected GIMP to have a more powerful tool to carry out photo enlargement.